REVIEW - Ascendant - Use a Potion! Ascendant, which came out last year on Steam, has finally arrived for it’s console debut on Playstation 4. The developers, Hapa Games, used popular crowdfunding website Kickstarter in order to raise the money to create this incredibly fun and addictive release. The game is a 2.5D beat ’em up, with rogue-like elements, something which is becoming increasingly popular on the indie scene. You are tasked with taking control of one of seven demigods, each of which is based on legendary warriors and heroes from mythology around the world. These include guys such as Midas (you know, the guy who turned his daughter to gold) or Chulainn, a guy from Irish mythology who supposedly took on a whole army single handedly. 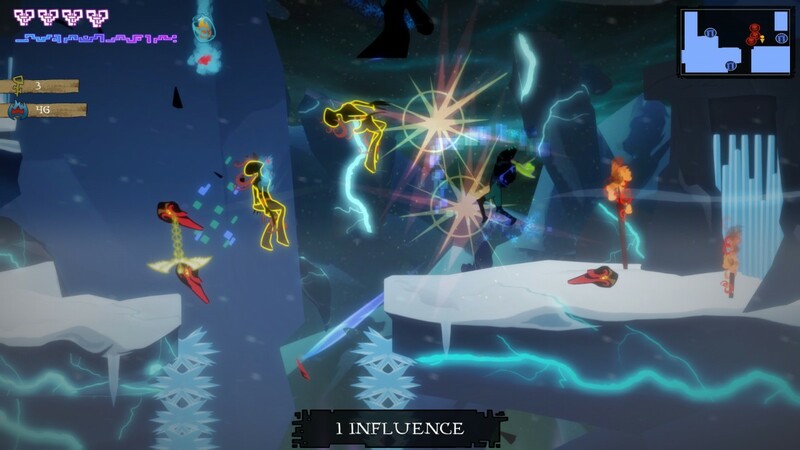 You must use these heroes to cut, slash and smash your way through a randomly generated world. You won’t be working alone though – with the aid of gods you must overcome your rivals and take down a tyrant god. The gameplay as follows the basic formula of the classic beat ’em ups such as ‘Ghouls ‘n Goblins‘, and also more recent titles such as ‘Viewtiful Joe‘. There is a roguelike twist though – when you die, it’s done. You’re gone along with everything you have picked up in the playthrough. The controls are quite basic in that you have a quick attack, which can be used to quickly stagger a variety of enemies including demons, heretics and weird looking flies that rather oddly look… let’s just say phallic. There is also a power button; this is where the fun really begins. When staggered, you can launch enemies flying across the screen, juggle three enemies at a time or even go full on ‘Super Saiyan’ and smash them into the ground. A critical part of success in Ascendant is the ability to use the counter function; perfect timing and skill are greatly required. It’s worth mastering though, as when you eventually get round to chopping up a few ‘Grunts’ or spinning around and deflecting a spell back at its sender, you feel like one of the gods yourself. 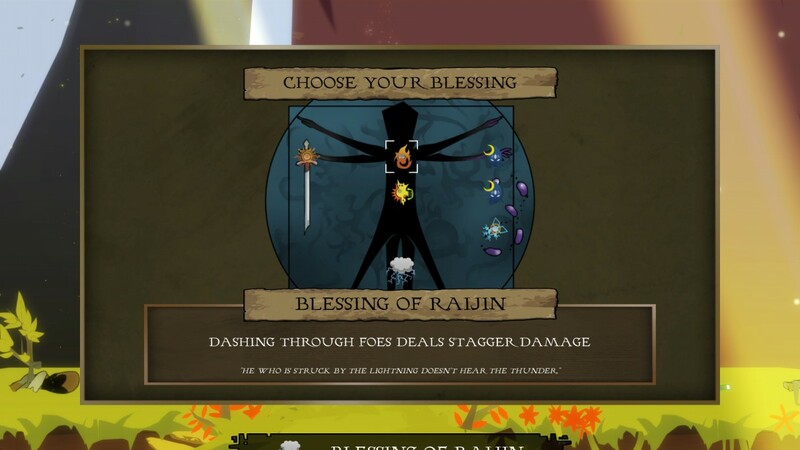 Finally the use of spells; there are a number of spells available in Ascendant. However, I found myself becoming frustrated with the aiming mechanic of these spells; sometimes it would appear random when shooting. This is a small imperfection that doesn’t take anything away from how fun this game is. Other elements I particularly enjoyed were the event rooms; here you would be presented with games of chance or challenges by the one of the many Gods. Success would grant you blessings which you can equip to your character for added abilities, or breaths that can grant you powerful one time abilities. Additionally the boss battles in this game are amazing, each one requiring a different method to defeat. They are never easy encounters and each level could have a number of different bosses to take on, adding a little variety to a game that at times can get repetitive. In terms of visuals, as I earlier noted, Ascendant has a 2.5D art style. This method compliments the gameplay for it allows the game to be simple, without looking too shabby. In regards to the looks of the characters, while they are 3D, they lack any distinct features, ending up looking like a three-dimensional ‘Mr Game and Watch’ with some war paint. This, and the fact it is relatively easy to die, results in it being quite difficult to get any emotional attachment to the characters. 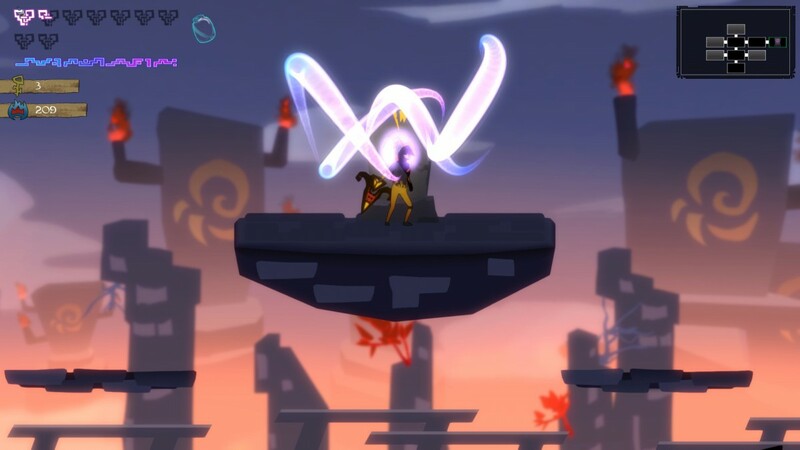 However each of the characters has a unique playstyle for you to test and try, although you begin the game with only two of the aforementioned seven characters – Memnon and Theseus. I would recommend using the former at first; despite his inferior strength he has more health, which is useful when attuning yourself to this sometimes soul-crushing game. In contrast to the looks of the characters, the enemies look a lot better. The majority of the enemies are extremely colorful and compliment the extremely well designed backgrounds; I particularly found the design of King Grunty (a boss) and his dance hilarious. The weakest part of the game is the complete lack of narrative. When starting the game there is no real information about what is going on in the game world. This is disappointing, mainlu because of the fact that there is so much potential! There are demigods, Gods and maces that play rock music whenever you hold them – how could it go wrong?! Adding to this, with the lack of any kind of facial features the characters were a little hard to relate to. The lack a story left Ascendant feeling a little characterless. On a brighter note however, is the music in the game. The music is especially well composed, offering that sense of immersion that is lacking with the story. The piano driven tune of Spring perfectly aligns with the season it represents, backed by a wind instrument that in this kind of mythological environment makes you feel like a woodland creature is going to pop out at any moment. The only problem with the soundtrack, due to the high difficulty and death count, is that the earlier levels tunes can get a little annoying as you are forced to repeat the same levels over and over. I couldn’t wait to get to the summer just for a change of song; maybe a few additional tracks could have made it a little more refreshing. This is again a small issue that doesn’t take anything away from what is otherwise a great soundtrack. I would like to conclude by saying that my time with Ascendant has been greatly enjoyed. 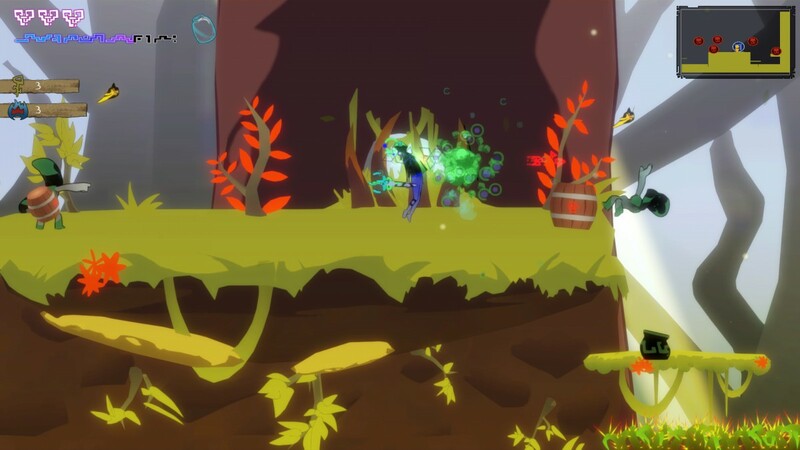 From the juggling antics enjoyable boss encounters, Ascendant provides a fun and self refreshing game that is extremely addictive. Its easy to pick up but difficult to master controls will hook you in to venture on through tough times and the many deaths that you suffer; you’ll die a lot, but will get that little bit further each time. There are a ton of collectibles too, offering a lot of replay value to those who master each level. With so many positives it’s a shame the game falls short with its narrative. Additionally, the slightly characterless designs of the demigods is a little disappointing, but overall these are minor qualms with what is a very enjoyable game.